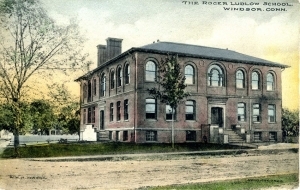 Description: Tinted postcard of the Roger Ludlow School, Windsor, CT. This building on Bloomfield Avenue was the Windsor High School from 1894 until 1922. It now houses St. Gabriel Parochial School.